Glengoyne Highland Single Malt Scotch Whisky has rounded off a year of spectacular award wins with three top prizes at The Spirits Business Travel Retail Masters 2014. 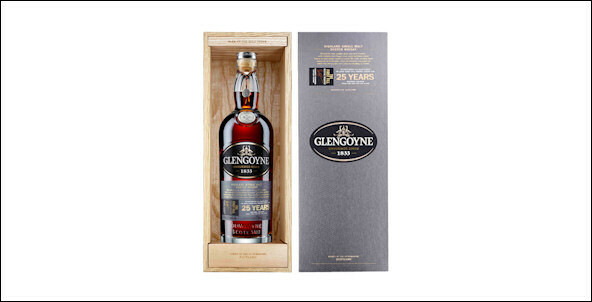 Glengoyne The First Fill 25 Year Old beat stiff competition in the Ultra Premium Scotch category to secure the top Master award for its “exceptional complexity” spearheaded by sweet fruits, raisins and dates. Glengoyne The First Fill 25 Years Old also lifted a Master award in the Travel Retail Exclusive category and a Gold award in the Marketing Design and Packaging category. The Spirit Masters series has fast become one of the most respected and high profile trade competitions in the industry, attracting a record number of entries from leading brands all over the world across a variety of spirits categories from vodka and gin to rum and Tequila. Glengoyne is owned by one of Scotland’s leading, independent, family-owned distillers, Ian Macleod Distillers. Glengoyne is handcrafted from the finest sherry casks within Glengoyne’s warehouses. Unlike most other single malt whiskies, Glengoyne dries its malted barley using only warm air resulting in an extremely subtle yet complex malt where all the delicate flavours are freely expressed. Glengoyne Distillery - highly regarded as Scotland’s most beautiful distillery is situated in Dumgoyne near Loch Lomond. Glengoyne runs its stills slower than any other distillery, proof that Glengoyne genuinely is “Worth the Wait”. For more information, please visit www.glengoyne.com.